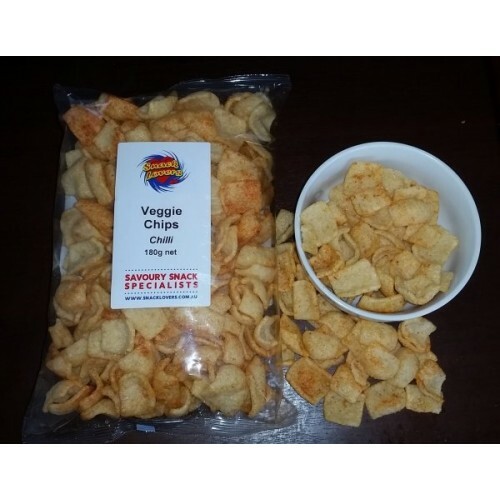 A square to rectangular flat snack which has a light crispy texture and is lightly seasoned with Hot & Spicy Chilli flavouring. Snack: Tapioca Starch, Maize, Sugar, Salt, Emulsifier (471), Mineral Salt (500)), Hi-Oleic Sunflower Oil, Seasoning: Salt, Sugar, Vegetable Powder (Garlic), Hydrolysed Vegetable Protein (Maize, Soy, Wheat), Lactose, Spices, Flavour Enhancer (621, 635), Acidity Regulator (262), Anti-Caking Agent (504), Paprika Extract (160c). Contains WHEAT (Gluten), SOY, SULPHITES & MILK.